Swinging London! During the 60s, London was the Mecca of pop music. This was where The Beatles and all the other major bands lived. This was where the British blues wave was born, along with the mod culture. This was where Carnaby Street could be found. This was where you could see the legends of tomorrow performing in small, intimate clubs – The Rolling Stones, The Who, The Kinks, Jimi Hendrix, The Small Faces, Pink Floyd, The Yardbirds, John Mayall & The Bluesbreakers and many others. Roadrunner describes how things were in the 60s: where it happened and when. What does it look like today? What is still there to be seen? The reader is taken on several present-day rock walks in the London of the 60s. We visit the well-known as well as the unknown places that have played an important part in the development of rock music. The reader will learn when and how the bands were formed, experience the places where many hit songs were written, and catch a flavour of important meeting-places that have influenced the history of rock. This completely new, richly illustrated guide shows exactly where the major artists lived, where the popular clubs, restaurants and recording studios were located, and much more. The reader may follow in the footsteps of the author or plan personal walks with the aid of the extensive index of individuals, bands and addresses. Where was the Marquee Club located? Which was Syd Barrett’s favourite restaurant before Pink Floyd made their breakthrough? Where is the apartment where Ringo Starr, Jimi Hendrix and John Lennon all lived? Where was the birth-place of British rhythm & blues? Come along to The Beatles and Brian Jones’ favourite local, which is still there today. The same goes for the pubs where Keith Moon, Jimi Hendrix and Eric Burdon liked to start their nights out on the town. We visit The Kink’s home district of Muswell Hill, and follow in the footsteps of The Small Faces in London’s East End. Roadrunner shows you the way to the right place, while also giving the reader complete information about the role a particular address has played in music history. Always illustrated by pictures showing how it looked in the 60s and what it looks like today. This book will entertain everybody who wants to experience London in a new and different perspective. 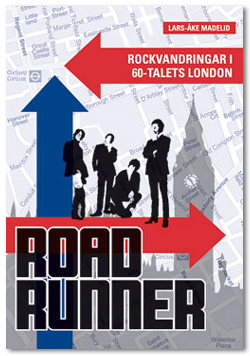 If you’re interested in music, you will read the book from cover to cover even before you’ve reached London! Pocket book, easy to carry along!